VIZ Media Dates "Golden Kamuy"
The early 20th century: Saichi “Immortal” Sugimoto is a veteran of the Russo-Japanese war and is scrapping out a meager existence. This is also the postwar gold rush on the wild frontier of Japan's Hokkaido region. Sugimoto stumbles upon the first “piece” of a map leading to a fortune in hidden gold belonging to the Ainu (an indigenous people of Japan and Russia). However, ruthless criminals and rogue Japanese soldiers are also hunting for the gold in the harsh northern wilderness. It will take all Sugimoto's talents and the help of an immensely-skilled Ainu girl named Asirpa to survive, let alone find the gold. 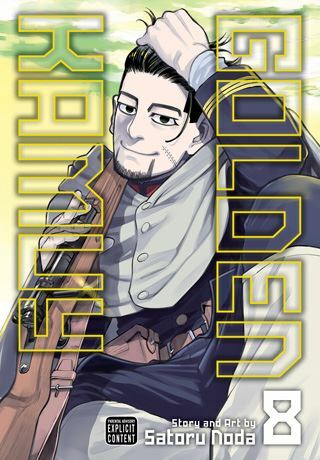 As Golden Kamuy, Vol. 8 (Chapters 70 to 80) opens, the diviner, Inkarmat, makes her move to find Asirpa, and she gets former 7th Division soldier, Genjiro Tanagaki, to help her. But why is she so interested in the Ainu girl? Meanwhile, our heroes' nemesis, Lt. Tsurumi, plots to make it difficult for any rival to find the tattoo “maps” to the treasure. So he finds psychotic taxidermist, Yasaku Edogai, and seeks to add him to his ploy to deceive the other treasure hunters. But how will Tsurumi convince the truly bizarre but supremely talented Edogai to use his talents in Tsurumi's service. THE LOWDOWN: The Golden Kamuy manga is certainly one of the best historical manga that I have ever read. It is so intense, yet creator Satoru Noda tells this story so beautifully. Golden Kamuy Graphic Novel Volume 8 does not offer more of the same. Yes, this volume is intense, but there is a cart race (of sorts) in the last act of this volume that had me flipping pages almost faster than I could read then. Also, I don't know if I want to call Noda demented, but his depiction of the taxidermist and his work is crazy-cray-cray. I would say that Edogai's story could generate at least a few volumes of manga, and, judging by Noda's imagination in depicting Edogai's talent, would also result in some interesting costumes for him to wear. I READS YOU RECOMMENDS: Fans of Westerns and of Japanese historical dramas will want to try the VIZ Signature title, Golden Kamuy.